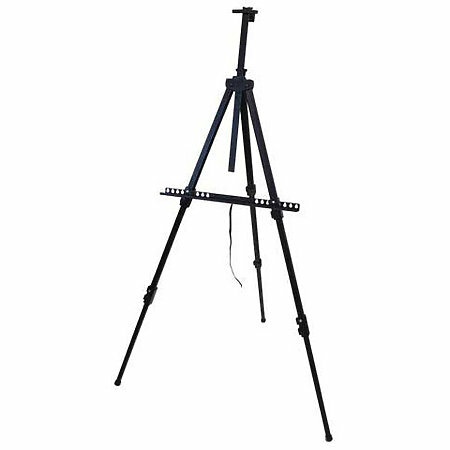 Great for indoor, outdoor or table top use, this stable light-weight aluminum easel accommodates canvases or panels up to 48"h x 1.5"d and will hold up to 25 lbs. The spring-loaded top clamp secures canvases in place and the canvas tray has two height settings for versatile positioning. Telescoping legs with non-skid rubber feet adjust with one touch control. Fully extended height is 69" and it folds to 25" for easy storage and transport. It includes a carrying case with shoulder strap and pocket. Weighs 2.5 lbs. Comes assembled. Adjustment instructions included.